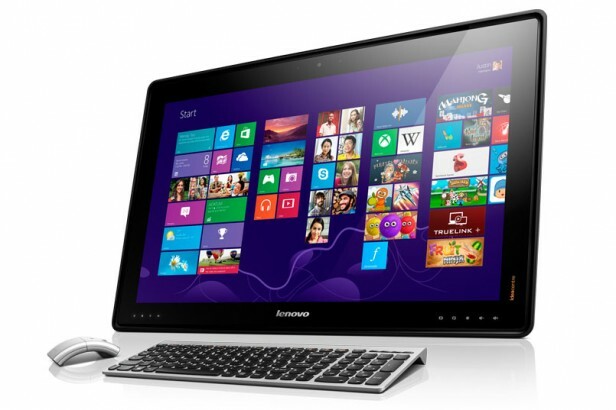 We are dealing here, according to Lenovo with a completely new product category. The Horizon Table PC carries out his work as well as conventional all-in-one computer, displays its full qualities but really only when he is lying down. Then it is really an interactive table where you can access from all sides on all content. So we can, for example, with several people sitting around the table access, independently of each other on videos or photos, slide it to us, rotate and zoom at will. It all looks very reasonable and works in our video also been great. Games for you and some of accessories is available. Thus can you play Monopoly with special dice, the e-dices. Re-roll really on the table and just as it is with other accessories, such as a kind of joystick that you just placed on the Table PC and then it controls your characters. Interesting idea from an oversized Windows 8 tablet to make a table surface that can be used by several people simultaneously. The huge Full HD display, it is due to the battery life of the box with two hours of fairly thin fails. But as a unit, which is definitely designed for use at home, this should not pose great difficulties, because there should always have an outlet within reach. Before I give you now see the video by us a Lenovo employee explains the Table PC, I give you even the hint along the way that the unit is already in the early summer come on the market. Prices we call you as soon as we find out.